Start with Outlook Online in the browser. 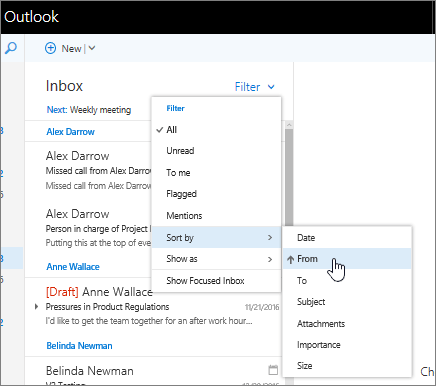 If you need more Outlook features, open the Outlook desktop version and see the Outlook Quick Start. If you’re a Mac user, see Outlook for Mac Help. Select Filter > Show as > Conversations to view related messages as a single conversation or thread. Select Filter > Show as > Messages to view related messages individually. 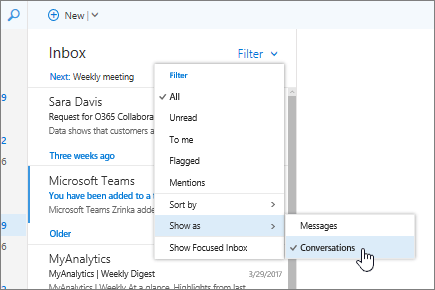 When you filter items in Outlook, you selectively choose what items are displayed, but you don't apply any actions to them, like moving them to another folder or forwarding them. 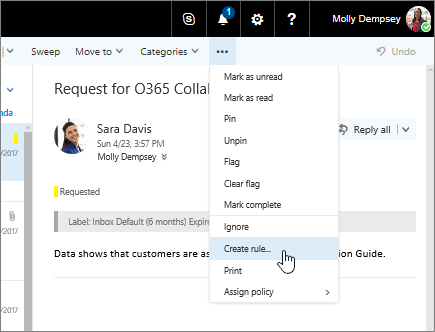 You can automate actions on incoming messages with Outlook Rules. In Gmail, you use Filters to automate actions on incoming messages. Select Filter and then select the Filter criteria, Sort by criteria, and whether to show messages in Conversations or Messages view. Gmail and Outlook both use a Conditions/Do this model to process and perform actions incoming email. Gmail calls this capability a filter, and Outlook calls it a rule. To create a new rule or edit an existing one, select > Mail > Automatic Processing > Inbox and sweep rules, then select + in Inbox Rules. Choose what you’d like the rule to do and select OK.